Preheat the oven to 175°C/350°F. Line muffin tin with muffin liners. To make the chocolate batter (recipe adapted from Linda Lomelino), combine flour, unsweetened cocoa powder, baking powder, sugar, and salt in a bowl and sift. Melt part of the butter. Beat egg in a bowl, add melted butter, part of the vanilla sugar, hot water, and milk, and stir well to combine. Add sifted flour mixture and whisk to combine. Divide the batter between the muffin liners and bake for approx. 20 min. at 175°C/350°F (insert a wooden skewer, cupcakes are done if it comes out dry). Briefly cool down in the muffin tin, then move cupcakes to a wire rack to cool completely. To prepare the strawberry filling, briefly heat up the strawberry jam in a pot, then set aside. Chop part of the strawberries and mix into the jam with the remaining vanilla sugar. To prepare the chocolate buttercream (recipe adapted from “Backbube” blog), chop half of the bittersweet chocolate, then set up a double boiler to melt the chocolate. Set aside to cool down. Sift the confectioner’s sugar. Cream the remaining butter in a stand mixer for approx. 5 min. Add the melted chocolate and sifted confectioner’s sugar to the stand mixer and beat until fluffy. Add heavy cream and beat again to incorporate. To make the chocolate-coated strawberries, chop the remaining bittersweet chocolate and melt using the double boiler. Dip the remaining strawberries into the melted chocolate (fully cover bigger ones, and partially cover smaller ones). Rest for approx. 1 min., then garnish with sprinkles of your choice. Set aside to harden, then refrigerate until you assemble the cupcakes. 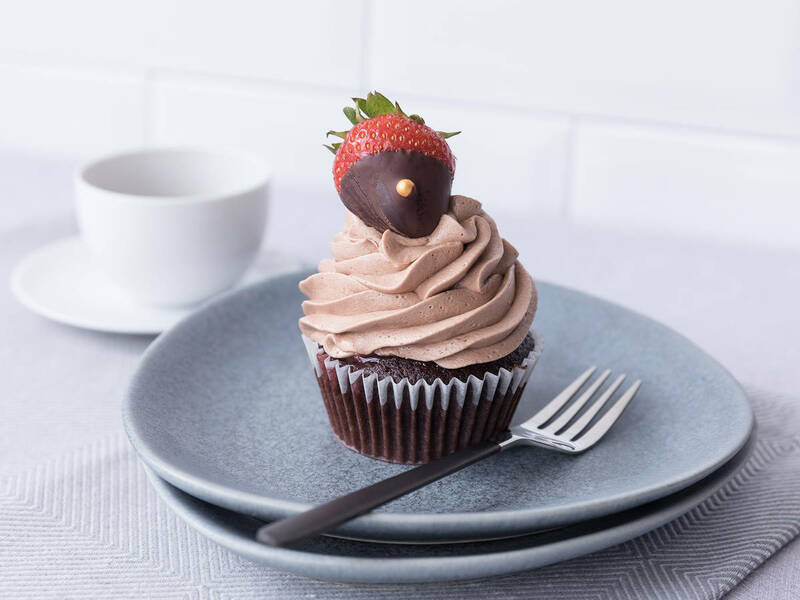 To assemble the cupcakes, use a small spoon to hollow out the middle of the cupcakes, then fill with strawberry jam mixture. Fill chocolate buttercream into a piping bag, and pipe onto the cupcakes with a star-shaped decorating tip. Garnish with the chocolate-covered strawberries. Enjoy!